No longer do you have to sacrifice performance in your next battlefield computer. The Getac B300 can survive an IED explosion (not really) and not miss a CPU cycle while rendering your masterpiece in 3ds Max. (really) The B300 comes packed with the latest computing hardware. Inside the tough exterior rests a 2.0 GHz Intel Core i7-620LM CPU, 2GB of DDR3 RAM, 250GB SATA hard drive, DVD drive, and a Gobi 2000 Mobile Broadband Module. There’s also an optional dual-battery pack, which Getac claims will get 22 hours of run-time. It just gets better too. This is truly the MRAP of portable computers. The B300 can be configured with an -20 degree low-temperature spec for, you know, watching a bit of Stargate SG-1 via Hulu when you’re ice fishing with your father-in-law. Then even with that spinning hard drive, the B300 is certified to MIL-STD-810G for ruggedness and shock protection and certified to IP65 for water and dust protection. I’m not sure how tough it is compared to a Panasonic Toughbook, but chances are this model will take a beating just fine. Expect the B300 to drop this coming October and hopefully you have a government-issued credit card to pay for it, too. It carries a $3,799 MSRP. The B300 offers two display options — a 700 NITs display, and the best-in-class rating of 1400 NITs display, which includes Getac’s exclusive QuadraClear display for easy viewing in extreme lighting conditions such as direct sunlight and reflective conditions including sand and snow. An HDMI port joins the standard VGA port allowing a multiple-monitor battlefield-ready solution. The -20 degree low-temperature option is now standard on all pre-configured sku’s. The B300 can also be configured with a dual battery option that provides up to 22 hours of battery life on a single charge. And, Gobi 2000 mobile broadband technology is now available as a pre-configured sku for quick delivery. The B300 is certified to MIL-STD-810G for ruggedness and shock protection and is certified to IP65 rating for protection from water and dust. Additional options for the B300 include the MIL-STD-810F – 509.4 for protection from Salt Fog, MIL-STD-3009 NRA & NRB for Night Vision and every B300 is Mil-STD-461F ready requiring only the purchase of a MIL-STD-461F power supply for electromagnetic interference applications. A built-in security feature using Intel® vPro™ technology enables IT specialists to maximize hardware-assisted security to better maintain, manage, and protect their business PCs. The B300 has a conveniently located finger print reader adjacent to the touchpad for the security required by government and corporate data management. Configured with a built-in Smart Card reader, the B300 increases identification & authentication security on administrator and remote access accounts while security criteria EAL 5+ encrypts valuable data by hardware, making data transfer more secure. Staying connected on the job is easy with the B300, which includes wireless options for Bluetooth, WLAN, GPS and 3G. The B300 has a suggested retail price starting at $3,799 (US). 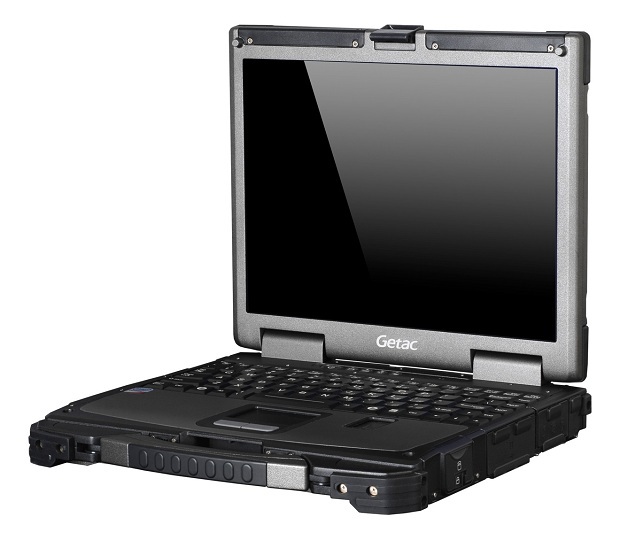 As with all of Getac’s fully rugged notebook, tablet and convertible computers, the B300 is backed by the industry’s best 5-year bumper-to-bumper warranty. Enjoy the peace of mind that comes with knowing that the B300 is covered by a warranty that includes damage that occurs due to accidental acts and environmental exposure. The new B300 will be available at the end of October through Getac Authorized Dealers.